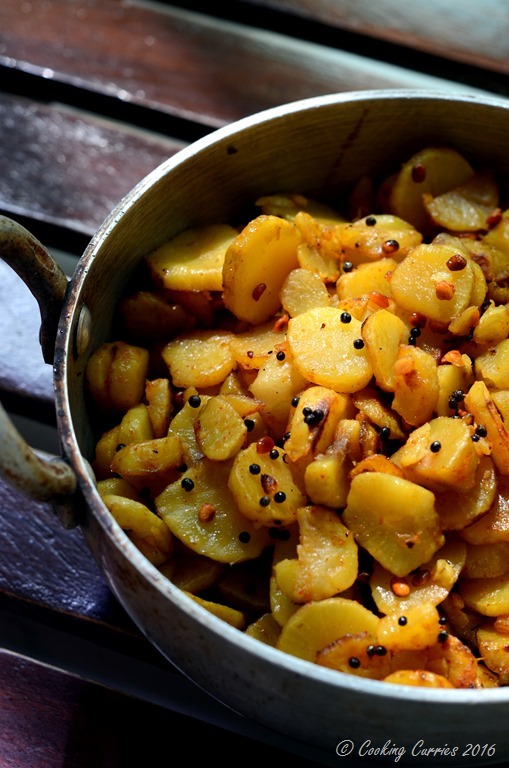 Earthy yet sweet tasting Koorka or Chinese Potato that is sautéed with mustard seeds and turmeric to bring out the intrinsic umami filled flavors of the vegetable. I walk into the kitchen and the fresh, wet scent of earthy soil fills the air. I hear the thud thud sound of something rolling and beaten in a burlap sack and I knew what it was for lunch that day. Appa probably got some fresh koorka / Chinese potato from the market and he is helping Amma make some of that for our lunch. These small tubers are often brought home with thick mud sticking to them and the easiest way to peel the mud and the skin off them is to beat it out of them. That is where the burlap sack and the thud thud sound comes in. That process gets most of the dirt and the skin off, the rest is peeled off by soaking the tubers in water and scraping the skin off with a small knife or your fingers. Even though they look similar to Colocasia root / Arbi / Seppankizhangu, they are not slimy to touch at all and more importantly does not itch your hands when you try to clean them. It is quite a process just prepping this root vegetable for cooking. Cooking it is another process in itself. You have to cook it in water to soften them a little, but not too soft that they get all mushy. Then you slowly sauté roast with oil on low heat so it cooks through and crisps up at the same time. Appa is very intentional about cooking certain things that he loves to cook. He believes that certain vegetables / dishes just have to be made in a certain way and it doesn’t matter how slow or fast the process it. He doesn’t mind slaving over the stove top to get it done just right. 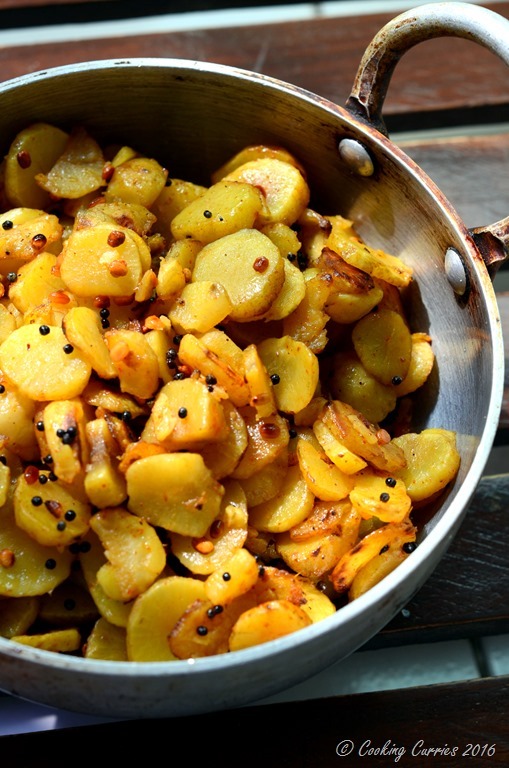 My brother and I would always fight for the crispier pieces and sometimes the best part is the ones that got stuck to the chatti / kadhai / pan and then at the end, Appa would sit and scrape out all of it. It was basically the essence of the vegetables, spices and everything crisped up by the oil. Appa grew up in a big-ish family of five siblings and my grandma would scrape out this goodness from the large batch of any veggie / root vegetable sauté she made for lunch and make little balls out of them as snacks for my Appa and his siblings when they came back from school. It was their after school snack with tea. It is so amazing how such memories with food trickles down generations. Now, hopefully I am patient enough to make this the right way so I can get the scrapey goodness out to give to V.
This recipe is courtesy of my Amma and Appa when they made it for me by request, the last time I visited them in India. The next time I see these vegetables around here, if I do, I will take some pictures to add to this post, so you can see what the vegetable looks like. I have seen them in the frozen vegetable section at the Indian Store and that is where I usually buy them here but mostly I make my mom and dad make them for me several times whenever I visit them. Some memories are just too precious to be had just once in your lifetime. 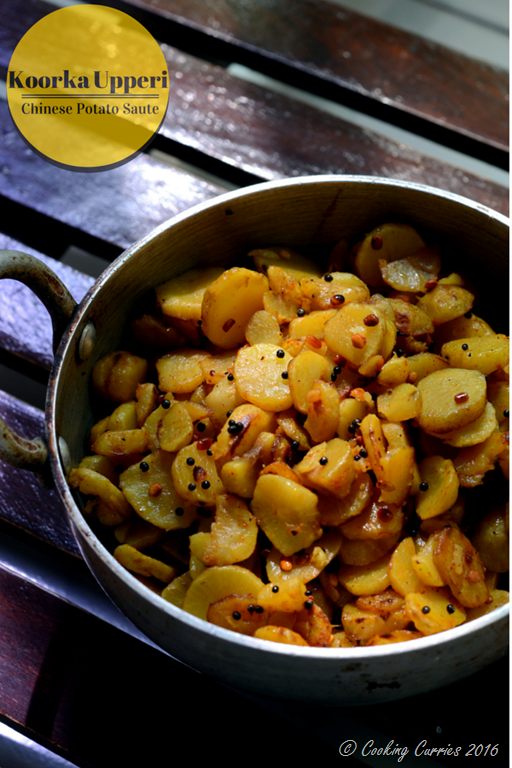 Cook the koorka in enough water with turmeric powder and salt, till it is a little soft to touch. Drain and keep aside. Heat 2 tbsp oil in a heavy bottom pan or kadhai and add the mustard seeds, once they splutter, add the urad dal, curry leaves, asafetida and chillies. Add the cooked koorka, give a quick mix and let it cook over low heat till the ones at the bottom crisp up a little. Add more salt if needed. At this time, you can be done cooking or you can add some more oil and toss them around a little and let cook over low heat for some more time, till more of them crisp up. Recipes for sambar and other dishes that can be served together with rice to enjoy this Koorka Upperi as a meal. Click on the image to go to the recipe. I learned something new today, I had no idea what a koorka was until now! Thanks for the education! This looks like a wonderful dish! I love how food and memories are so closely tied together! I have always wanted to cook with Chinese potatoes. I have had a similar recipe a few years ago and fell in love with it. Definitely going to try your recipe.